It is with a heavy heart that I bear this sad news. The owners of the Ozark Medieval Fortress have reached the difficult decision to not reopen in the 2012 season. The Ozark Medieval Fortress had closed for the winter season in November, but now its future is uncertain. 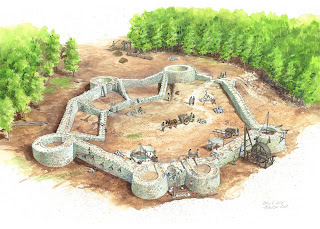 For those who were unaware, the Ozark Medieval Fortress is a construction project using thirteenth century building techniques to build a medieval fortress in Arkansas. Here is the architect's drawing of what it looked like after one year of construction and when it opened to the general public in 2010. They had received a lot of notice and publicity for the project, but not enough tourists to make it financially viable to continue. who are currently looking for a buyer or an investor. It is a wonderful project and one that I believe will ultimately be like the Field of Dreams baseball diamond in Kansas where "if you build it they will come." Unfortunately, the droves of people have not arrived yet in order for the owners to continue. Please spread the word about this opportunity in your medievalist communities and if you are going to the International Congress on Medieval Studies this coming May, I urge you to mention it there as well. 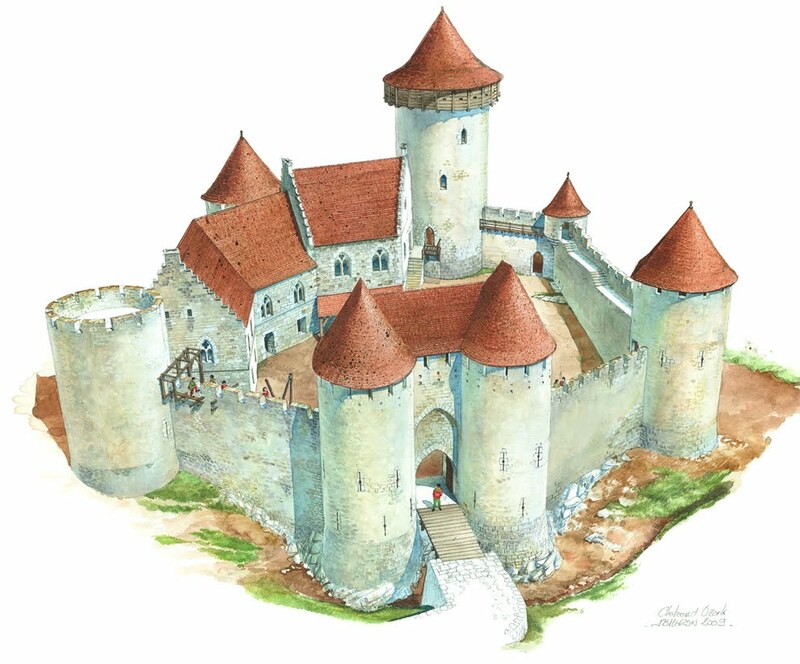 I hope to speak with the owners of the Ozark Medieval Fortress soon via Skype and will let you know if they ask for anything else in the means of supporting their dream of building a medieval castle in America using traditional methods. This is the architect's rendering of what the project would look at its completion in twenty years' time. It would be a shame if it were permanently abandoned. It is sad. I'm trying to brainstorm ideas of who to contact in the hopes of becoming an angel investor to reopen the site. Being so close to a major tourist attraction like Branson, Missouri should bring in a lot of visitors. Then once word-of-mouth spreads on how cool it is we shouldn't have to worry too much. Last Wednesday night I caught just a bit of the History Channel's show by Larry the Cable Guy where he visited the Ozark Medieval Fortress last summer. That's the kind of publicity it needs and hopefully, :fingers crossed:, an angel will step in and help save it so it can continue as originally planned.